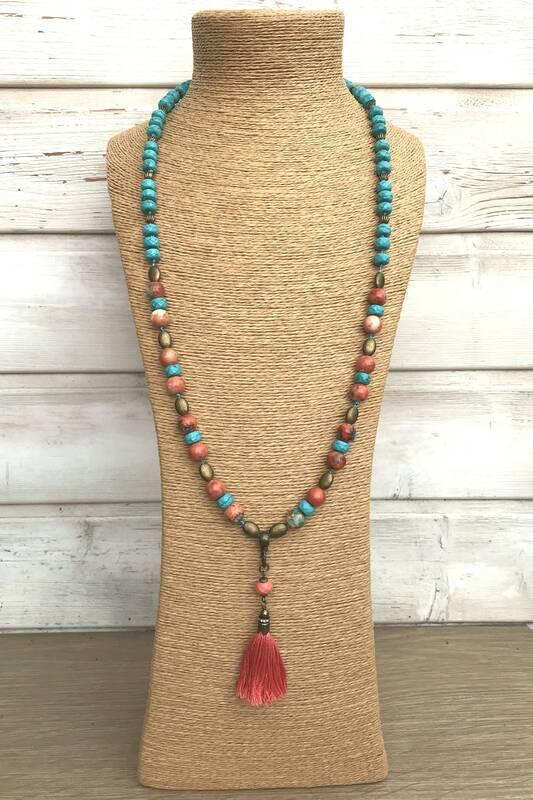 Hand knotted beads of turquoise blue ocean jade, orange oxide, cream and turquoise faceted rondelle magnesite with copper beads and decorative orange tassel. 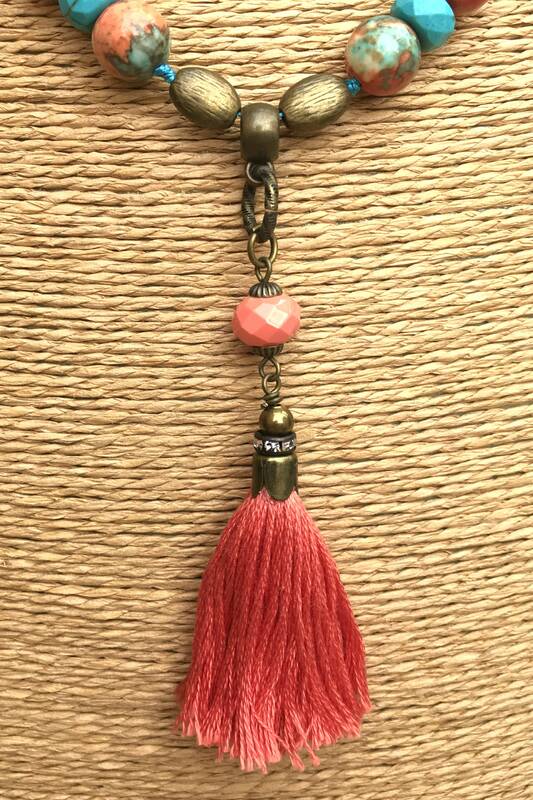 Total length of tasseled necklace: 48 cm. Geologically there are two types of minerals that we call Jade, Nephrite and jadeite. The nephrite, is a calcium and magnesium silicate and is mainly found in New Zealand, Australia, Canada, Alaska, in the state of Wyoming (USA), China and Russia. It is known as the green stone and in Maori they call it Pounamu. The nephrite is more abundant than the jadeite, dark green, striking, oily-looking with interesting inclusions and color variations. Jade symbolizes purity. It is the stone of feelings and emotions. 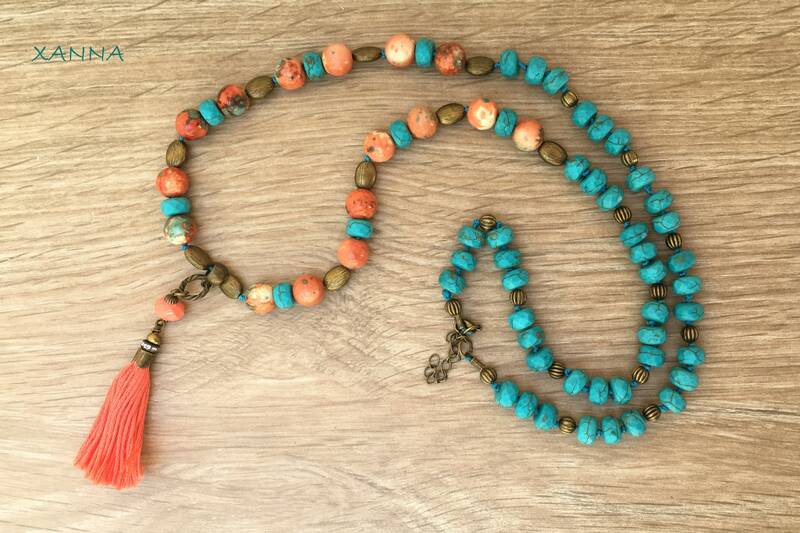 It helps to obtain wisdom, serenity, brings harmony, favors self-esteem, frees us from negative thoughts and gives inner peace. Open your mind for good ideas to flow. Calm your nerves. It connects you to the Earth. 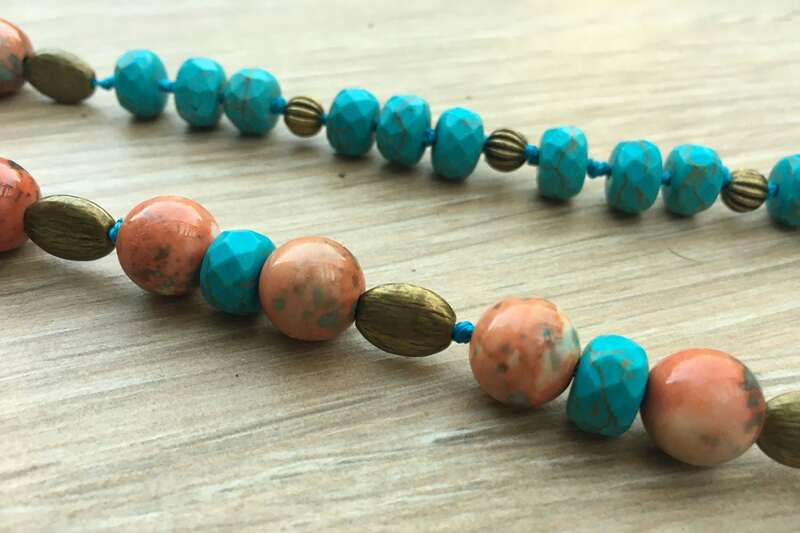 Magnesite is said to stimulate an optimistic feeling, it helps to accept oneself and to love oneself, it has a soothing and relaxing effect, it is effective against nervousness, anxiety and irritation, it promotes patience, it stimulates the ability to listen. Magnesite was discovered in the 8th century, at first being designated as "pure talcum soil", as chemically the magnesium it contained was not yet known. With the identification of magnesium it began to be called magnesite, it is also known with the common name of "sea foam".